There’s a small, highly motivated group of students concerned about the environment, and they’re working to start a grassroots movement to enhance sustainability on Syracuse University’s campus. No, this is not a flashback to the 1960s. It’s happening right now thanks to SU student Emma Edwards, a freshman policy studies major in The College of Arts and Sciences. Edwards, who cares deeply about nature and the environment, worked closely with SU’s Sustainability Division last fall to start the Syracuse University Sustainability Club because no such campus student group existed at the time. Since November, the group has only met a half dozen times, though this hasn’t stopped them from immediately getting down to business. 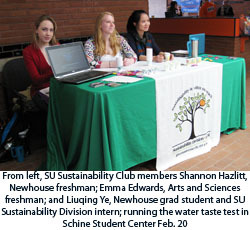 To start educating the campus community on the wastefulness and bad environmental aspects of bottled water consumption, the group held a water taste test in the Schine Student Center Atrium on Feb. 20. They offered unmarked samples of bottled water, tap water and filtered tap water to passersby, and then asked which sample they preferred. Although some people correctly identified the bottled water sample, more than half of the 86 participants said they preferred the taste of the tap or filtered tap water. These results are encouraging for the SU Sustainability Club members. They already know that Central New York’s tap water ranks among the cleanest and best-tasting water in the nation. Now they want everyone to know this, and to realize that there’s no good reason to spend money on bottled water and all of its extra plastic packaging. Bottled water consumers can do their wallets and the environment a favor by drinking tap or filtered tap water using reusable water bottles. “By the end of the semester, I would like the Sustainability Club to finish the first step toward decreasing the use of bottled water, which is research,” says Edwards. To help make SU a more reusable-water-bottle-friendly campus, the group is surveying every campus water fountain. They’re plotting the locations of fountains and rating their service quality (water temperature, pressure, cleanliness, etc.). Once the students complete this research, they’ll know which water fountains are providing sub-par service so they can suggest replacing them with water bottle filling stations. SU’s Sustainability Division, which works to enhance sustainable operations and actions across campus, has been very supportive of Edwards and the SU Sustainability Club. Although greater student involvement is still on the group’s wish list, they already have a set of “regulars” who have been involved from the beginning. SU freshman Pasang Lhamo, international relations and public policy major, recently attended her first SU Sustainability Club meeting after hearing about the group from Edwards. Lhamo is interested in environmental issues, specifically the privatization of water. As the SU Sustainability Club looks to reach more students and expand its activities, the group is enhancing its operations along the way. They recently started a Facebook page and began holding meetings more frequently “in order to be as efficient and effective as possible,” explains Edwards. The SU Sustainability Club meets from 6:30-7:30 p.m. on the second Thursday of the month in the Hall of Languages, room 205, and on the fourth Thursday of the month in the Hall of Languages, room 201. For more information, contact Edwards at eledwa01@syr.edu.